The latest innovation in swimming pool safety and the perfect cover for new or existing pools is PoolGuard. PoolGuard is a durable, multifunctional cover operated easily by one person either manually or semi-automatically. PoolGuard is completely impenetrable, providing outstanding safety for children and pets. It sits on the pool coping and seals it completely, ensuring leaves and debris come nowhere near the water’s surface. This allows for the quick and easy removal of debris before swimming. Finally, PoolGuard pool covers are brilliant insulators and will help retain the chemicals, water and heat pumped into your pool. This translates into thousands of dollars-worth of savings every year. The question is not why would you purchase a PoolGuard, but why wouldn’t you?! When in place, PoolGuard will make your pool completely impenetrable providing you with total peace of mind. When fully tensioned, PoolGuard pool covers protect children and pets from falling into your pool. PoolGuard is strong enough to support the weight of an adult and is completely lockable *. *In Australia at this time PoolGuard Swimming Pool Cover Systems do not replace the need for a security fence around your pool. Parental supervision is always recommended for children in the vicinity of any body of water. PoolGuard is not to be relied upon as the sole safety mechanism in a pool environment. PoolGuard pool covers provide 100% protection from leaves and other debris that would ordinarily end up in your pool. This will result in less time spent vacuuming and more time to enjoy your pool. Unlike other pool cover systems, PoolGuard pool covers sit on the pool coping. This allows for quick and easy removal of leaves and debris from the cover surface before retraction. This is not possible with ordinary pool covers, and as a result most debris falls back into your pool when rolling the cover up. Removal of leaves from a PoolGuard pool cover can be easily achieved with a broom or blower. PoolGuard pool covers are brilliant insulators. Unlike bubble and foam covers, PoolGuard boasts a 150mm air gap between the cover and water’s surface. The result is unsurpassed insulation levels saving precious energy and money. PoolGuard pool covers also reduce the rate of chemical evaporation from your pool, maintaining more consistent chemical readings and ensuring lower water and chemical consumption costs. PoolGuard boasts a heavy duty, no nonsense design, engineered for many years of valuable service. It is constructed from a generous, durable cross woven polyester, which is PVC coated and UV stabilised. The anti-fungal treatment ensures PoolGuard stays free of mould, even when wet. 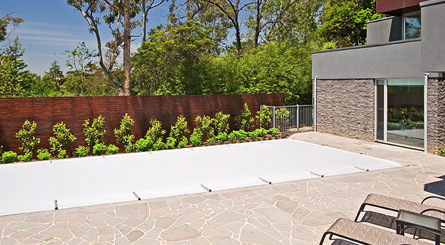 PoolGuard pool covers are reinforced by anodised aluminium tubes that span the width of the cover. PoolGuard pool covers are incredibly easy to operate via our manual or motorized winders. Rolling the cover on and off the pool can be done in minutes by one person. Using the easy rolling mechanisms, PoolGuard rolls up on itself, ensuring a compact, lightweight roll at the end of the pool. 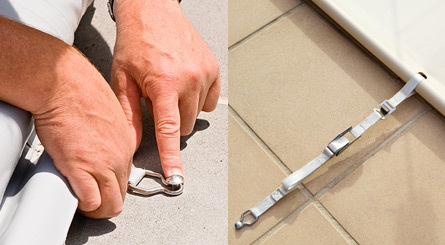 The roll can be left stationary or unclipped and relocated whilst you enjoy your pool. 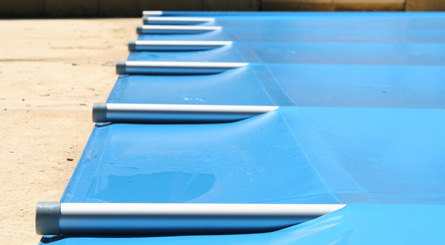 The unique design of the PoolGuard Pool Cover allows for quick, effective installation. 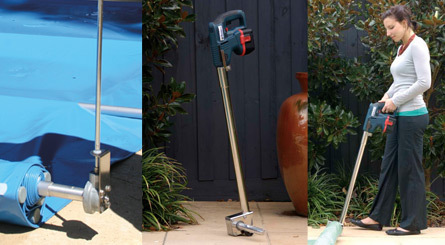 PoolGuard is attached to your pool at only six points using self-sinking stainless steel connections. This method of installation prevents injury to children at play around the pool and does not detract from the beauty of your pool when the pool cover is removed completely. NB: Please note the colours displayed above are for illustration purposes only, please request a physical sample before ordering.